Discussion in 'vBench (Works in Progress)' started by MarquisMini, Sep 15, 2008. 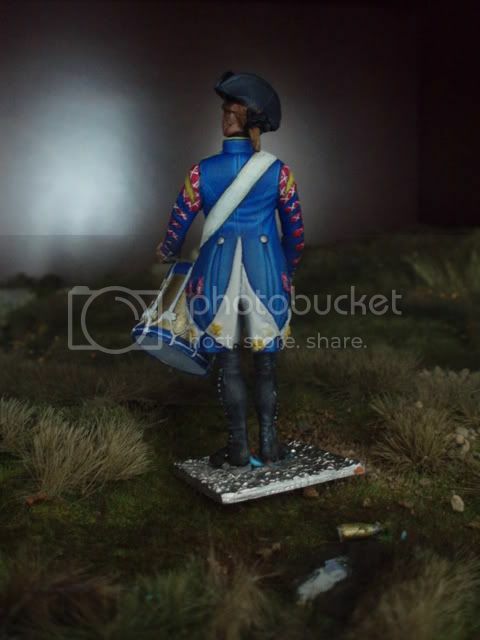 These pictures are of a figure I originally completed early in the diorama. As I've added others around it, I decided this drummer could benefit from my experience and was in need of a little enhancement. So, he came down off the shelf and received a bit of additional paint using some of the techniques I've picked up here at pF. Excellent work, although sometimes it's good to keep your old figures to judge how far you've come. I am forever stripping the paint or taking them apart and NEVER putting them back again. The blues look really good. 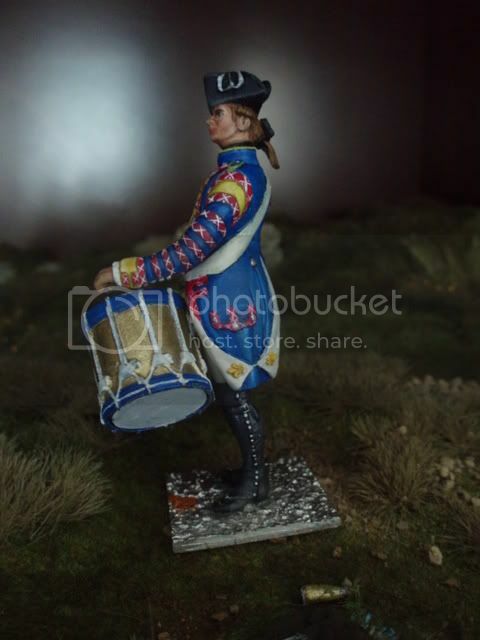 You might want to add some more depth to the drum though. A wash or two might do the trick. 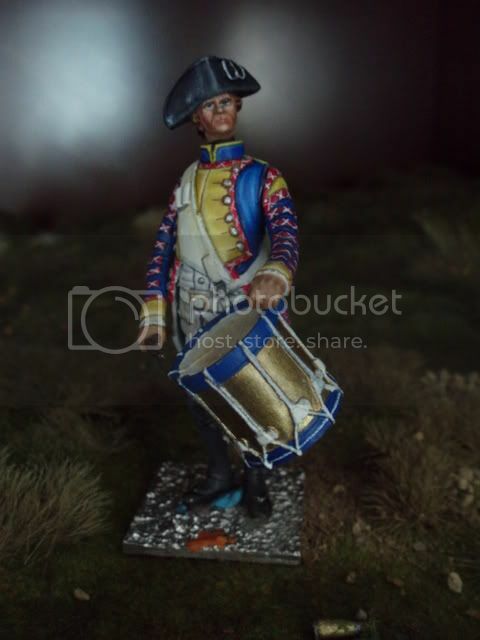 And/or you could put a regimental symbol or or pattern or something on the drum to break up the gold a bit. 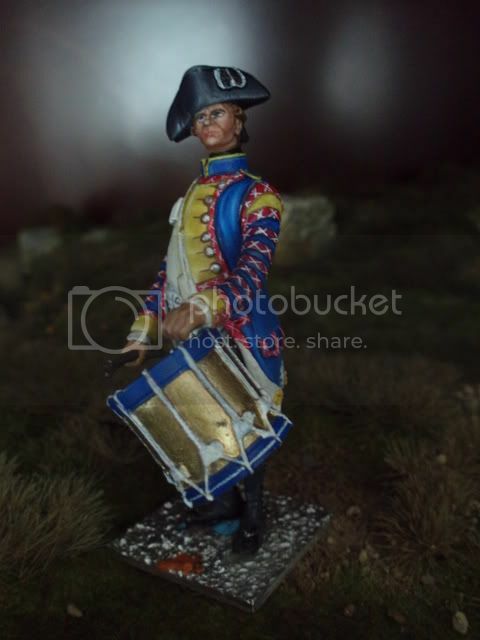 I think the tricky thing about a big diorama is having all the figures look similar stylistically as one is picking up tips and improving so touching up earlier figures now and again is a good idea. Now for individual figures, it's nice to keep them as they are so you have an idea of progress made. I would give the drum some more shade too. A bit of burnt umber or so mixed in the gold would do the trick. Great work, the back of the jacket looks very nice! I agree with the others that the drum lacks shadows and highlights for the gold and blue.